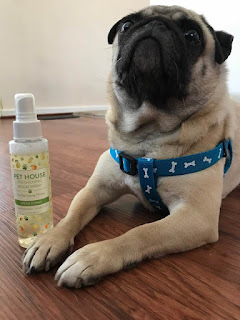 A Sampling Bee: One Fur All Room Spray Review & Giveaway! Welcome to A Sampling Bee! Today, I share with you One Fur All's Pet House Freshing Room Spray! Our Fur All's Spray is the best way to freshen your pet loving home. Each scented spray is infused with a blend of natural essential oils as well as an effective odor neutralizer. One Fur All's Pet Spray is safe to use around your pets and family. The sprays are 100% non-toxic, never overpowering and allergen-free. All of One Fur All's products are made in the USA. One Fur All Pet House Freshening Room Spray comes in four amazing scents: Fresh Citrus, Lavender Green Tea, Mango Peach and Sunwashed Cotton. I got to try the Fresh Citrus Scent- a sparkling blend of fresh orange, lemon peel and sweet vanilla sugar. This effective and fast acting room spray is sure to freshen up any room! Ingredients: Water, Fragrance (including odor neutralizer and essential oil blend), Leuconostoc/radish root ferment filtrate (natural preservative), sodium phytate (stabilizer derived from rice bran. We have two pugs and they stink! One Fur All's Room Spray is great! It works so well!! I love the Fresh Citrus scent. It's not too strong and it works so well at eliminating stinky pet odors. I love using this spray on their dog beds, winter coats and collars. This spray also works well around the house. I use it in the living room, bathroom and bedrooms. It also works great for freshening up our vehicles. I love how the spray is safe to use and that it doesn't contain any harsh chemicals or preservatives. It's also wax-free so it doesn't leave any kind of residue when sprayed. This spray is a must-have if you are a bed owner. I look forward to trying their candles! Enter to win one One Fur All Freshening Room Spray!! One winner will receive one Fresh Citrus Room Spray! US only! Enter below! Good luck!! Yes I have pets - two senior cats. I have a dog, a cat, and a tarantula.